Apparently March is a month for betas. I was invited to test a few different apps over the last few weeks and I’m happy to say there is plenty of great app development coming in the future. Other than the betas on my homescreen, there aren’t too many additions or deletions. Vesper has returned. Sometimes you just need a simple notepad. That, combined with a new iPad version, means Vesper is here to stay for a bit longer. I’ve also added the latest edition of Calcbot to the mix. Obviously, Tapbots is becoming one of the — if not the — most well known iOS development companies in the world and Calcbot doesn’t leave anyone short. The app is simple and is delightful to use. It has a masterful app icon. And the utility of the app is significant — the pro upgrade for conversions has been super handy with the fluctuating Canadian dollar as of late. Lastly, I’ve pushed Pinner for Pinboard off my homescreen after a lengthy run. I don’t use Pinboard as much on my iPhone, instead opting to view my favourite links on the iPad. 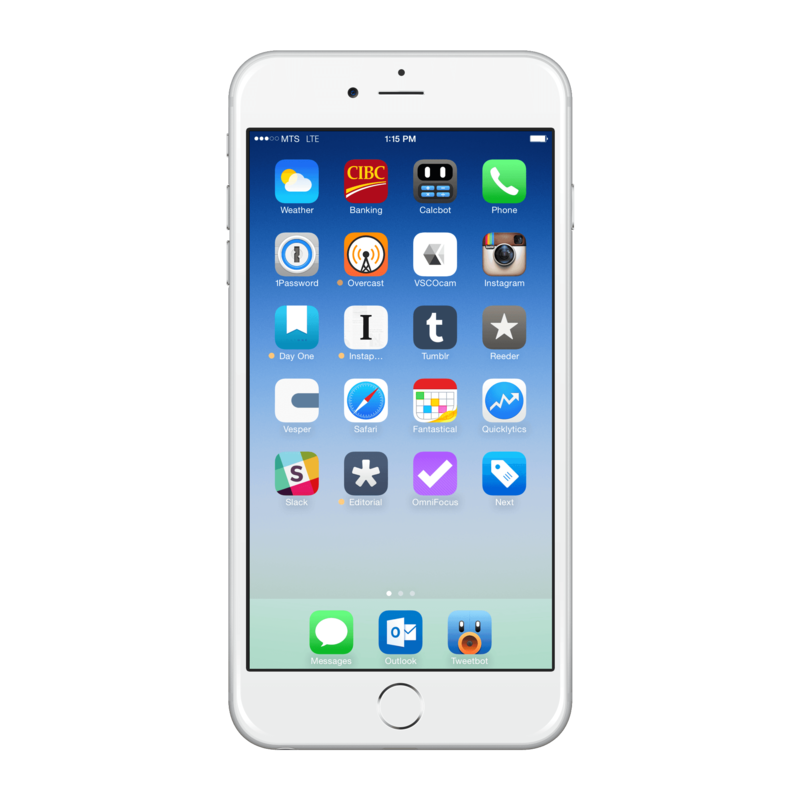 Pinner’s iOS 8 extension is still heavily used on the iPhone, but the actual app itself has not been used enough to warrant a homescreen spot. The biggest news of the month surrounded Tapbots and Tweetbot 4. Tweetbot 4 looks to include an iPad version, so all our wishes will soon be granted. Other than that big news, again, very little has changed on my iPad’s homescreen. SimCity BuildIt moved to my second homescreen after I surpassed level 30 and was able to build the Empire State Building. Since passing level 30, I’ve fallen away from SimCity and fallen toward Alto’s Adventure. You’ve undoubtedly heard of Alto’s Adventure by now, and if you haven’t paid the $2, I can’t stress enough how much you’re missing out. I also pushed Omnifocus into the dock once more, as I have altered things ever so slightly at the office. I have actually begun to bring my laptop to the office in order to use Omnifocus on the Mac. Therefore, any simple changes at home are done on the iPad version and my use of the app has skyrocketed. Calcbot has joined the foray just like it has on the iPhone. 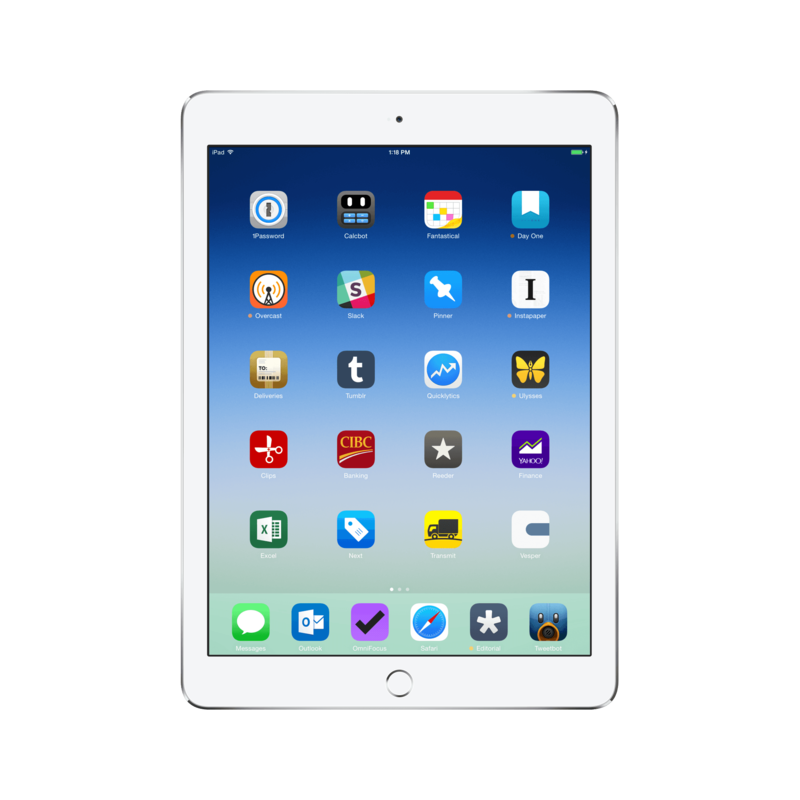 I don’t use the iPad version as much, but that app icon is too good to pass up. Lastly, Vesper has become universal, meaning I have a way to quickly sync simple notes between iOS devices. I’m not 100% convinced I’m in love with Vesper for iPad in the same way I love Vesper for iPhone. I feel like there is plenty of wasted space on the iPad — especially on the larger 9.7” screen — and I’m intrigued to see the evolution of the app going forward. There you have it for another month. The first of March marks the beginning of income tax season here in Canada, so I’m sure it’s going to be one exciting month. See you on the other side.